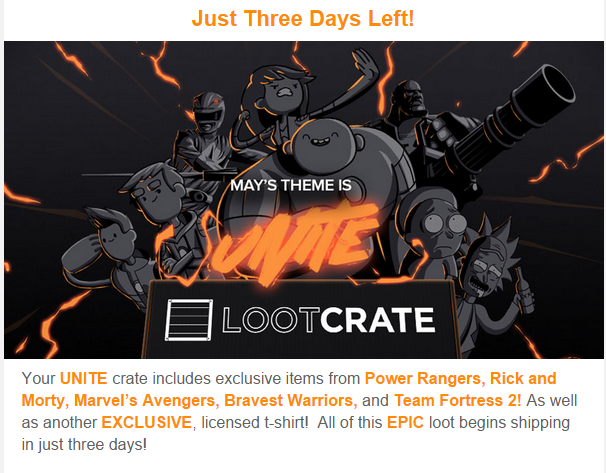 You have THREE DAYS to get your hands on the May 2015 Loot Crate. The theme is Unite and will include items from Power Rangers (I never watched this show, I only made fun of it), Marvel's Avenger (swoon! ), Bravest Warriors and Team Fortress 2. This month will also include a licensed T-shirt (my favorite kind of T-shirt!). What You Get: Awesome gamer/geek loot! Sometimes T-shirts (like this month!) Plenty of comment inducing collectibles to surround your computer desk with, all delivered right to your door. You don't even have to go out to get it! Well, except to the mailbox. Sign up here! Use coupon code NEWS3 to save $3 on your first box. You can see some of my past Loot Crate reviews here. I've been getting it for quite awhile now. It's the first gamer subscription I got and it has a special place in my heart.